This darling little poppet kept Mummy waiting almost two weeks past her due date, but I think we can all agree she was certainly worth the wait. Earlier on in her pregnancy, Mum had booked in her newborn session with me at the Samphire studio but as we got closer to the date and little Madison hadn’t yet decided to arrive, we easily rescheduled. I move my newborn sessions all the time and rarely work to the original date I have in the diary, so am totally used to it. 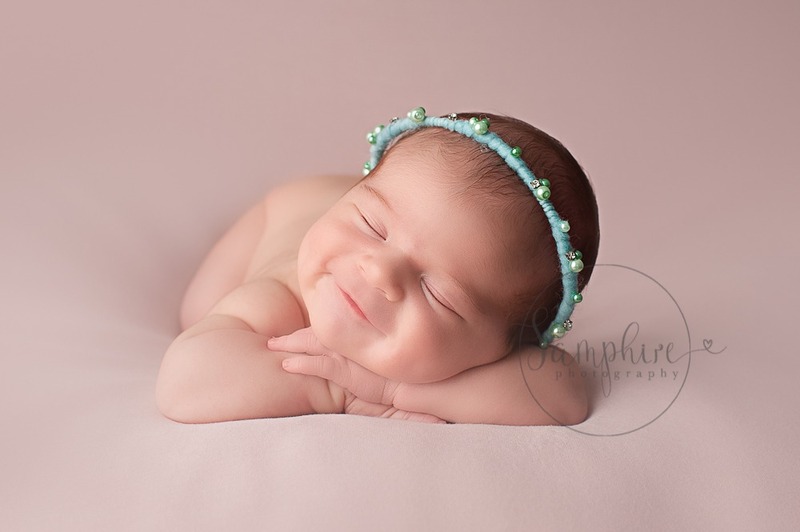 Our new session date was when Madison was 8 days old, an ideal age for newborn photographs. During the first two weeks baby is likely to sleep more soundly and curl up more easily into adorable poses. With the studio at a cosy temperature and a full tummy, even a very awake baby will soon fall into a deep slumber, enabling me to capture the most adorable images for Mum & Dad to treasure. 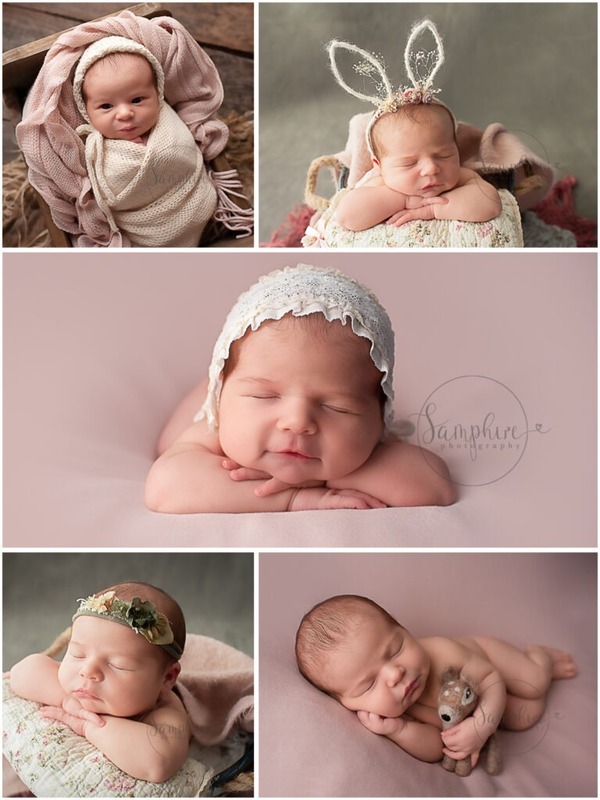 The soft pinks with touches of green are a perfect colour-scheme for this special little lady, with a subtle touch of lace and floral, plus the wraps, bonnets, headbands and a super cute felted fawn, it all makes for a very pretty portrait session. 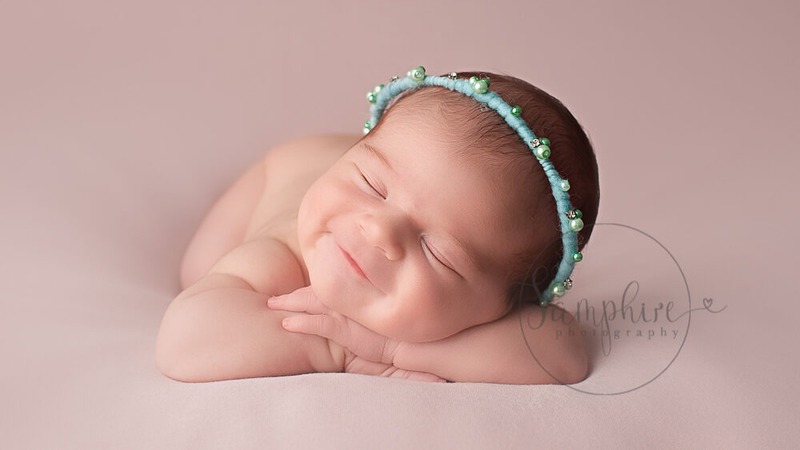 I do love this bunny ear headband which is simply too adorable for words from Love Rosalie.